The season for partying in the garden may be over. 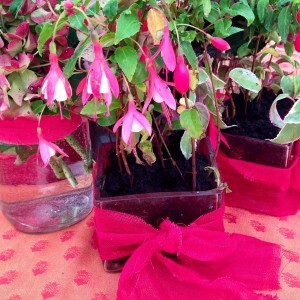 But as you plan next year’s planting, are you going to be needing flowers for a party? In middle-sized gardens, growing a cutting patch for a specific event is a bit of a risk – it would be too easy to have your main flowers over or not yet out. And you want the garden to look good, too. 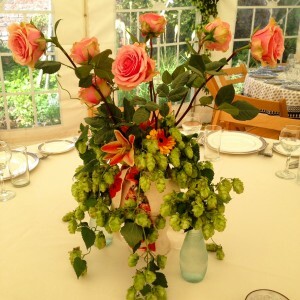 I’ve just decorated a marquee for lunch for 98 people for less than £100, by mixing my garden and ‘foraged’ flowers with a few bought flowers and pot plants. 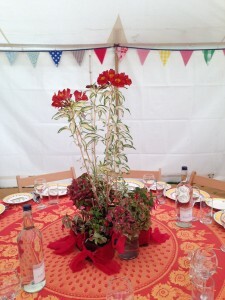 Garden designer Caroline Garland‘s advice to me on party decorating was to think big, using strong colours, when doing flowers for a marquee. A big white space will overwhelm pretty little posy arrangements. But, with ten tables, that’s ten big vases, which I didn’t have. Go for big bold splashy colour when decorating in a big white space – this is an alstromeria sent to me by Gardening Express that I hadn’t got round to planting. It’s surrounded by red fuschias and hydrangeas. I decided that to create the impact I needed, the answer would be to crowd up a whole load of smaller vases, arranging three, four or five together. So that’s…er..40 vases? I’m a passionate collector of car boot fair china, but even I don’t have 40 vases. So I decided to wing it, doing something slightly different on each table, mixing collections of smaller vases (and jam jars etc) with single big ones. I didn’t have 10 big vases, but I did have one big vase…seen here with Hydrangea Arborescens Annabelle and crocosmia seed heads, both from the garden. 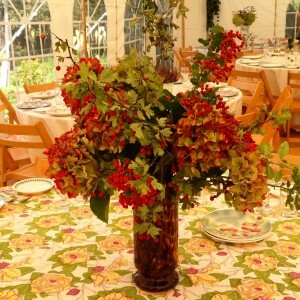 A few florists’ flowers add highlights of something different, and can give a mass of garden flowers a real lift. I popped into our lovely local flower shop, Lotty’s Flowers, to order 15 vintage pink roses (‘Geraldine’) and 10 stems of blue lisianthus. I planned to spread these between several vases with garden stuff. A few of Lotty’s Flowers’ roses with hops and a lily plucked from an Interflora arrangement sent to me by a friend. This one can be tricky, as you obviously can’t take anything from a field unless you’ve asked the farmer. But there are a few semi-derelict open spaces near us, where hawthorn and teasel grow wild. I set out with my friend, Amanda, with our dogs, in the rain, and discovered that cutting both is extremely prickly. 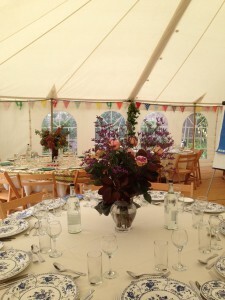 I only had 3 tablecloths for the hired 6ft round tables, and even these only just covered them. I thought about buying sheets, decorating dust cloths (too transparent) and even bedcovers or curtains, from charity shops or car boot fairs. 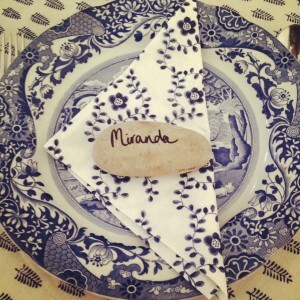 But my china has been collected over 40 years – a few weeks is not enough time to find a hoard of gorgeous table cloths at bargain prices. So I hired cream cloths for all 10 tables but put coloured cloths on top for just three of them. 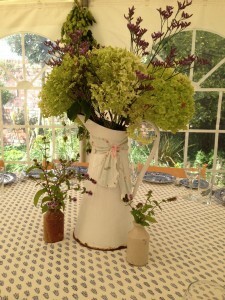 My favourite – the blue and white table, with a jug from a junk shop, Hydrangea Annabelle from the garden and lisianthus from Lotty’s Flowers. The little flowers are chocolate mint from the garden in old inkwells from a market. The bow is a fabric end from France. 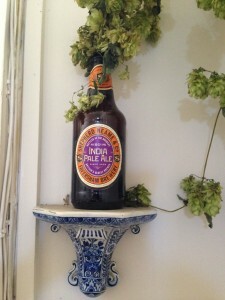 We were very lucky – we have friends who run the lovely Syndale Farm, one of the last hop growers in Kent. They gave us a car full of hop bines to wind round the marquee poles. And another friend, Fiona, had made yards and yards of bunting for her daughter’s 21st. Since then it has partied more than any It Girl, travelling to decorate friends’ marquees in its own travelling basket, so we borrowed it. There’s a delightfully chic little shop in Normandy called Lin et L’Autre, selling fabrics, buttons and trimming. While exploring this with my friend, Emma, we found them selling baskets of linen trimmings and other ends. As I was so short of vases, I bought lots of ribbon and fabric ends for a few euros, to tie round the necks of empty jam and Kilner jars. 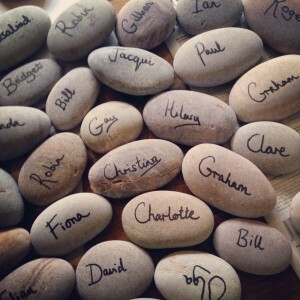 The shop also had notices written on large grey stones in black felt tip, which I loved so much that Emma gave me a whole pile of stones for name places. Probably the most useful garden plants were the hydrangeas – I have three ‘Annabelle’ and two pink ones, and even cutting a few blooms for several vases hasn’t made any impact on how the plants look in the garden. I think you could even ask friends for a few if necessary – most hydrangeas can lose four or five blooms without looking different (and they cost about £4 a head in the shops). Obviously, if you’re partying earlier in the year, it would be different. I would have used fennel from the herb bed instead of mint (just one plant would have provided masses). I’d have foraged cow parsley instead of teasel. I think euphorbia would have been good, too, along with allium heads, which offer alot of shape and impact. I tested some of the foliage for a few days beforehand – the chocolate mint in flower was particularly long-lasting, as were leaves from pyracantha and cotinus, but robinia wilted overnight. Earlier in the summer, I would have had roses – but I’ve noticed that some types fall apart after a few hours in a vase. Roses and lisianthus from Lotty’s flowers with Cotinus Coggyria leaves. Collecting china over 40 years from junk shops and car boot fairs means that it was cheaper than hiring plates. But alot of washing up! 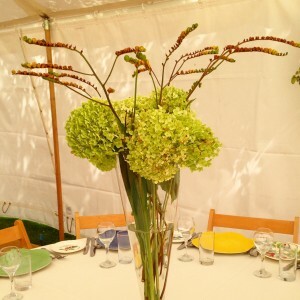 I didn’t start out with a plan, but having every table different saved us numbering the tables – they were called White, Blue and White, Teasel, Berries, Chillies, Heather, Orange, Crocosmia, Roses & Hops and Roses & Lisianthus. Mr Middle-Size insisted that people with gardening knowledge had to be put on Crocosmia as no-one else would recognise it. 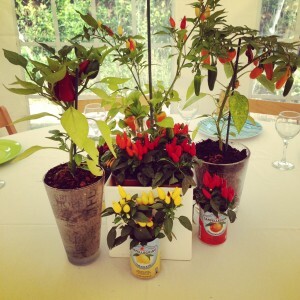 A mix of vases – from San Pellegrino tins to a white planter and a glass vase that had been a scented candle. I thoroughly enjoyed doing it, but luckily the marquee company, Best In-Tents Marquees, happened to deliver the marquee a few days earlier, or I’d never have finished in time. It has really made me appreciate how much hard work florists do. Don’t under-estimate how much time and effort it would take you to do it yourself, if you decide not to get professional help. Support from friends and family is key, too – not only did we borrow the bunting, but also a vast selection of salad bowls. 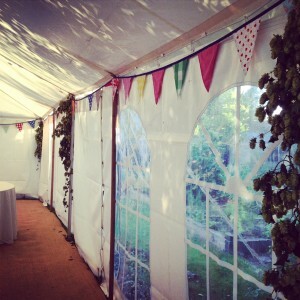 Our children, Freddie and Rosie, put up bunting and hops, and helped out in lots of ways, as did lots of others. It was a lovely thing to do, and we appreciated everyone’s help so much – but now I also appreciate what the professionals have to offer, and why it costs what it does. And that was just the decorating…..
Let me know your decorating tips. And if you’ve found this piece useful, do share it using the buttons below – thank you! 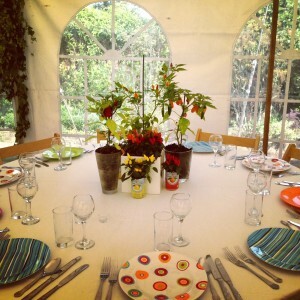 6 comments on "How to party in the middle-sized garden"
Great post! One piece of advice, why not buy a marquee instead of hiring. They are surpisingly affordable and it means that you can party all summer! Good point, and something I often consider. What fantastically ingenious ideas for a colourful celebration – only sorry we weren’t able to come and enjoy it in person but it looks amazing and has given me a string of ideas if we ever take the plunge and throw a similarly grand ‘do’. It was all SO WORTH IT! A lovely reminder of a really lovely day. And of how you dont have to spend a fortune for stunning effects. Personally, I have never been quite sure about the etiquette of foraging. Hedgerows are ok aren’t they, and kindly farmers with bridle paths through their land are hardly likely to mind a few armfuls of cow parsley. But some people do get very edgy about wild flowers…. I tend to ask about doing anything on a farm – even picking things like teasel, as I don’t know what might be important for what. And I think you’re right about wild flowers, although I’m sure cow parsley isn’t protected…or the thing that’s like it, although the other thing that’s like it, hogweed fennel, is ‘of international scientific importance’ so I’d never dare pinch any of that.